I read this article and found it very interesting, thought it might be something for you. The article is called Latest cheers and jeers from the campaign and is located at https://votesocialism.com/latest-cheers-and-jeers-from-the-campaign/. Businesses grossing more than $20 million per year will finally pay some taxes with the revenue used to help the homeless crisis in Seattle. This includes Amazon, the business run by the richest man on earth. 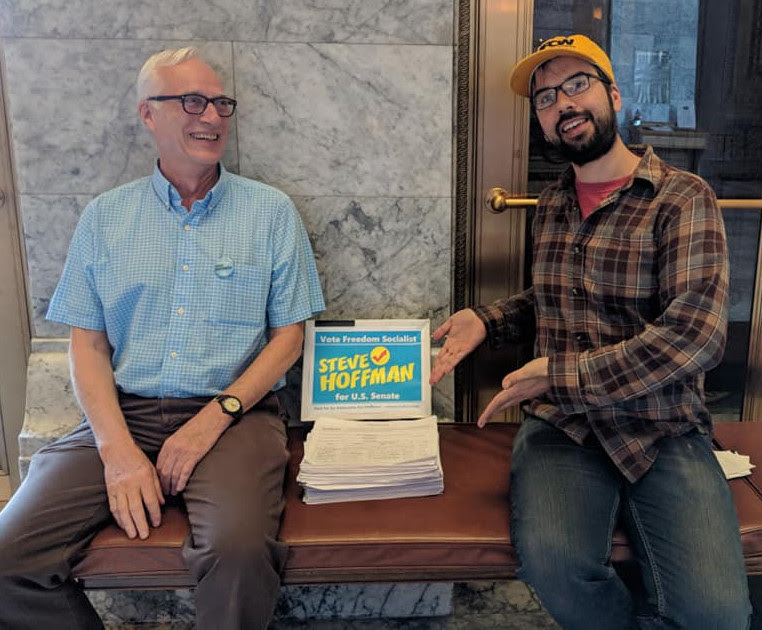 While this is a move in the right direction, the Hoffman campaign continues to call for taxing wealth and corporate profits to pay for more housing and social services, and for the city to stop the brutal sweeps of tent encampments. Read on for more news from the Hoffman campaign. 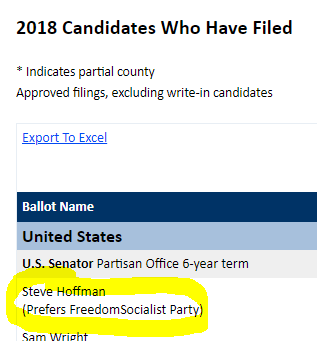 Steve Hoffman made the August primary ballot! Our campaign team – Doreen, Jared and Chris – were first in line to deliver 2,669 signatures to the Secretary of State’s office in Olympia at 8:00 a.m. Monday. The elections office staff spent the next few days crosschecking those signatures with the list of registered voters and confirmed that there were at least 1,740 acceptable names. That’s the number needed to qualify Steve for the ballot as well as waive the $1,740 filing fee. Congratulations are in order all around! Note: You’ll see in the image on the right that there is no space in the Freedom Socialist Party listing between the words “Freedom” and “Socialist.” This is because the state of Washington has a limit of 16 characters in the party name for U.S. Senate candidates. “Freedom Socialist” with the space is 17 characters. We have written a protest of this rule to the Secretary of State because it discriminates against third parties. It is one of the many arcane laws that discourage third parties from running for office and needs to be dismantled. We’ll keep you posted. Steve supported spirited University of Washington graduate student strikers this past Tuesday. UAW Local 4121 represents the students-employees who are pushing for better pay and health coverage so they make enough to live in Seattle. Stand up for human rights! This week, several left groups came together to organize a picket to counter the ultra-right ideology of Joey Gibson and the Patriot Prayer group who are planning a rally in downtown Seattle. Gibson tries to cloak himself in respectability by running as a Republican candidate for U.S. Senate, but his rallies bring together people who believe in misogyny, separation of the races and outright fascism. Groups regularly seen at his rallies include Identity Europa, Proud Boys, Cascade Legion and Atomwaffen Division.The Picket against bigotry, white supremacy and fascism will be on Sunday, May 20, 2:30 p.m., Westlake Park, on 4th between Pike and Pine. Steve and his campaign urge you to come to this counter protest and help expose Joey and his gang. Steve spoke at the Retired Public Employees Council and a good discussion followed. During the talk he proposed closing U.S. military bases and using the money saved to build massive public housing as a reasonable solution to homelessness and rising rents. He explained why he supported the head tax on big business and got an enthusiastic response for this and his strong record of urging organized labor to fight harder to defend workers. Stand up for Human Rights! 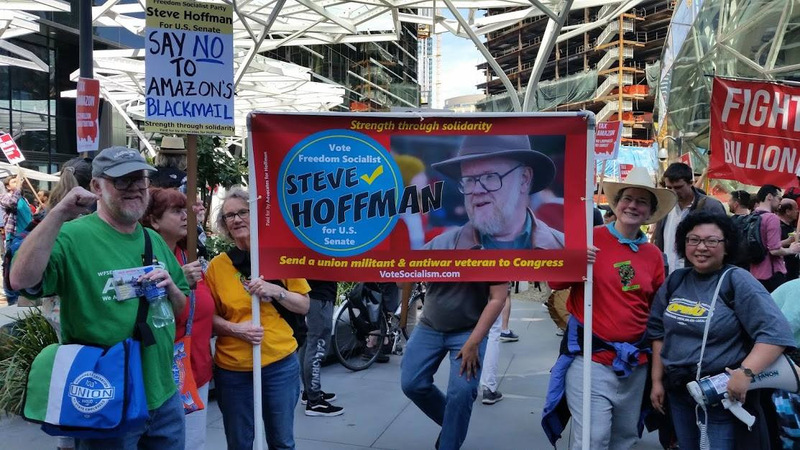 Picket against bigotry, white supremacy and fascism – Advocates for Hoffman will be at the Sunday, May 20, 2:30 p.m. protest at Westlake Park in downtown Seattle. 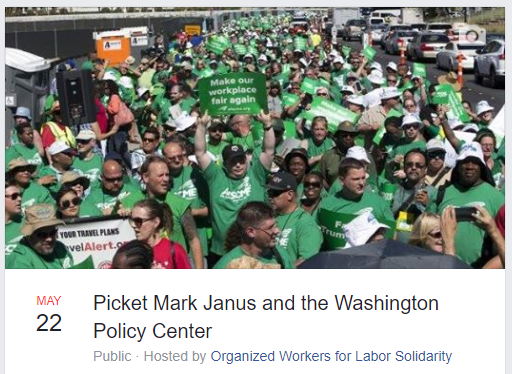 Find Steve with OWLS (Organized Workers for Labor Solidarity) protesting Mark Janus and the Washington Policy Center, Tuesday, May 22, 7:00 a.m. at Hyatt Regency Bellevue, 900 Bellevue Way NE. Janus will be speaking during the “Solutions Summit” sponsored by the Washington Policy Center at the Hyatt. 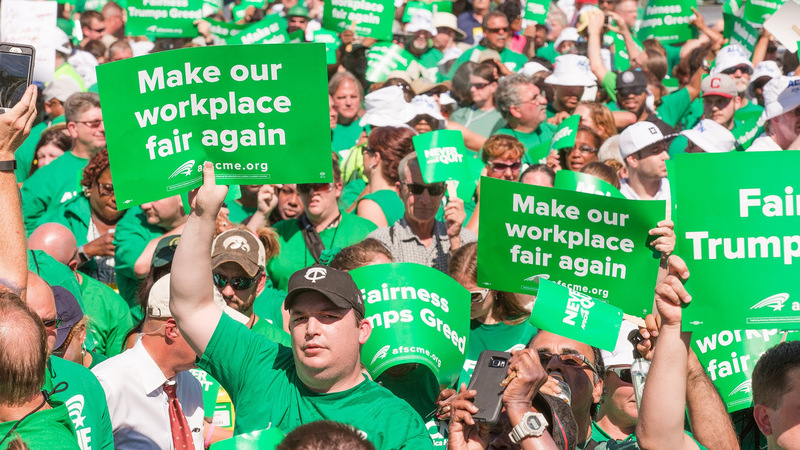 Janus is the lead plaintiff in the anti-labor Janus vs. AFSCME case heading to the U.S. Supreme Court that would allow union members to skip paying dues while still using the union’s services. The Washington Policy Center is a reactionary “think” tank with an agenda to kill organized labor and smash all workers’ rights. Volunteer every Wednesday evening 6:00 – 8:00 p.m. Meet at campaign headquarters, 5018 Rainier Ave. S., in Seattle’s Columbia City neighborhood. You can look forward to yard signs and window hangings to distribute. And there’s always calling, door belling, and other projects to help spread the word about Steve’s campaign. Can’t make the Wednesday volunteer nights? Feel free to swing by New Freeway Hall to help anytime, Monday through Fridays, 10:00 a.m. to 6:30 p.m. Call for weekend times or to see how else you can help out! If you’ve received a fundraising letter from the Hoffman campaign please consider sending the return envelope back with a donation. Or contribute online here. No need to wait to receive the fundraising letter! Send checks to Advocates for Hoffman, 5018 Rainier Ave. S., Seattle, WA 98118, or donate online. If the amount you send the campaign is over $200, please include your name, mailing address, occupation and the name of your employer to satisfy federal law.